Published on Monday, 6th of January 2014 . Last year, I decided I’d write a book. For only fourty pages, it sure took a lot of time and effort. I will further appreciate the amount of time and work that goes into authoring books whenever I read them in the future. 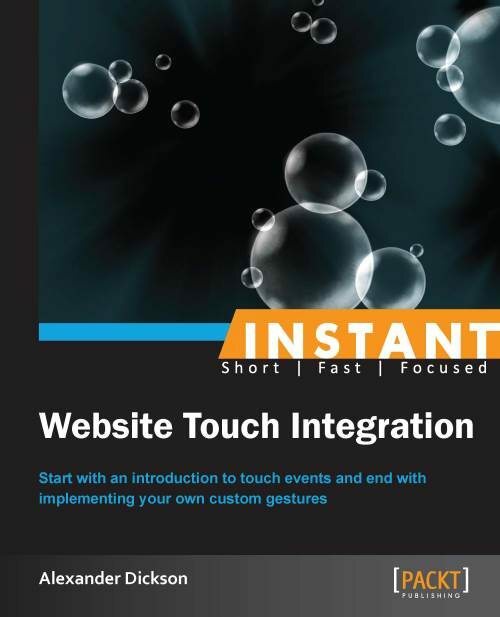 My book, titled Instant Website Touch Integration, is about touch events in the browser, that is, the Touch API that Apple popularised. It talks about using the raw API to do some fun stuff, explaining everything through writing a simple paint application that I’ve (not so cleverly) named Finger Painter. Writing it was mostly enjoyable, and I’m glad I gave it a crack. There were some issues with the editing experience, but it was all cleared up in the end. I’d like to thank Damon Oehlman for being a technical reviewer, catching many things I overlooked. Thanks mate! As usual, here is where I tell you to have a go yourself. Go on, write a book! You’ll love and hate the experience, but it will be worth it in the end when you get it out the door. Want to discuss this post? Just mention me @alexdickson.